Explanation: A dark Sun hangs in the clearing sky over a volcanic planet in this morning sea and skycape. It was taken during this week's total solar eclipse, a dramatic snapshot from along the narrow path of totality in the dark shadow of a New Moon. 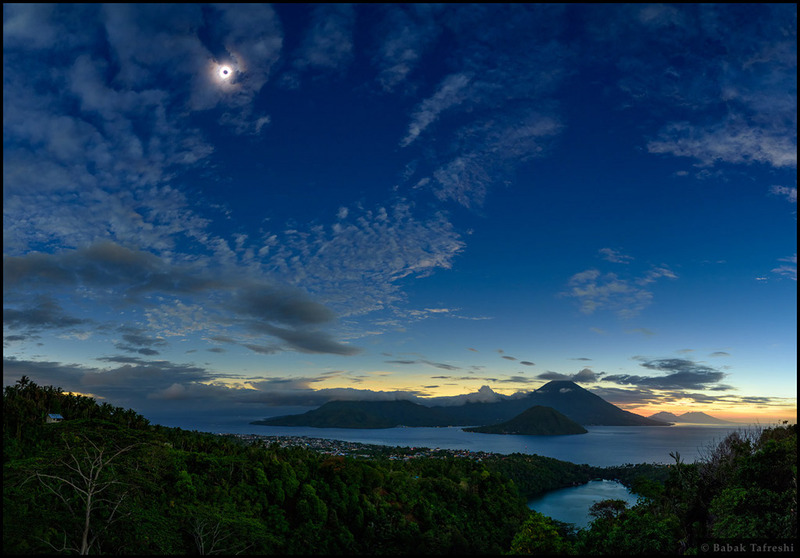 Earth's Indonesian isle of Ternate, North Maluku lies in the foreground. The sky is still bright near the eastern horizon though, beyond the region's flattened volcanic peaks and outside the Moon's umbral shadow. In fact, near the equator the dark lunar umbra is rushing eastward across Earth's surface at about 1,700 kilometers (1,100 miles) per hour. Shining through the thin clouds, around the Sun's silhouette is the alluring glow of the solar corona, only easily seen during totality. An inspiring sight for eclipse watchers, this solar corona is the tenuous, hot outer atmosphere of the Sun.